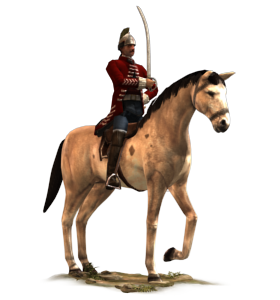 These horsemen have many national titles, and military fashion plays a huge part in their employment and naming: light horse, chasseurs à cheval, chevau-légers, even hussars and dragoons are used as titles by light cavalry forces. Regardless of the name, their purpose, tactics and equipment usually have much in common. They disdain armour, even the sensible steel skull caps favoured by many beneath their officially sanctioned tricornes and helmets. They carry swords, carbines and pistols, but they are not expected to charge home, merely harass and pursue enemies. Their horses are always fast with good endurance, well bred and well looked after: a cavalryman without his horse is, after all, useless.